Move aside big developers, here comes the small guys and they are packing heavy, these games made us skip some AAA titles. 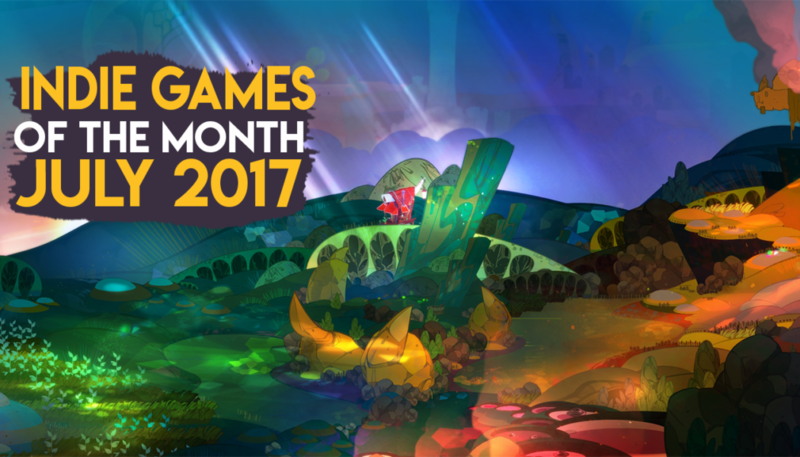 These are the top 10 Indie games of the month. The End Is Nigh is a sprawling adventure platformer where the player takes control over Ash, one of few “things” that have “survived” the “end of the world”. Follow Ash as he flops his way through a future of pain and suffering. Feel his stress levels rise as you throw him into an endless swarm of decaying, mutant animal-like creatures and help aid his final epic quest… to simply make a friend (out of pieces of people he finds along his journey). Step into the polished shoes of The Cleaner, a professional crime scene cleaner for the mob. There’s no business like the cleaning business, and right now business is booming…Sneak around crime scenes avoiding detection from the guarding cops as you vacuum up blood, hide bodies and remove evidence in this 70’s styled, fast paced, 2D action/stealth game. Sundered is a horrifying fight for survival and sanity, a hand­-drawn epic from the ​creators of ​​Jotun. It is a replayable metroidvania where you resist or embrace ancient eldritch powers. You play Eshe, a wanderer in a ruined world, trapped in ever-­changing caverns filled with hordes of terrifying enemies. Harness the power of corrupted relics to defeat gigantic bosses, at the cost of your humanity. Resist or embrace. The party game nobody asked for, but everybody needs. SOYF: S#!T ON YOUR FRIENDS is a local multiplayer competitive brawler for 2-4 players! Assume the role of adorable creatures and attempt to poop on your friends to find out who reigns aerial excrement superiority. Do your best to die, or to save your enemies from death in this frantic multiplayer game about life and death. Stayin’ Alive is a game about four wheelchair-bound retirees who have decided it’s high time to meet their maker, and four nurses who must keep the old geezers alive at all costs. Choose your side and let the dying/saving begin! Escape From BioStation is a sci-fi adventure game which places you in the role of a Rob Bot, the last robot citizen of a dangerous ancient space station.You’ll take on a host of evil robots armed with your deadly super squirrel. Tackle a variety of puzzles, platforming challenges and explore the BioStation which is stuffed with loot, hulking bosses, traps… and acorns.